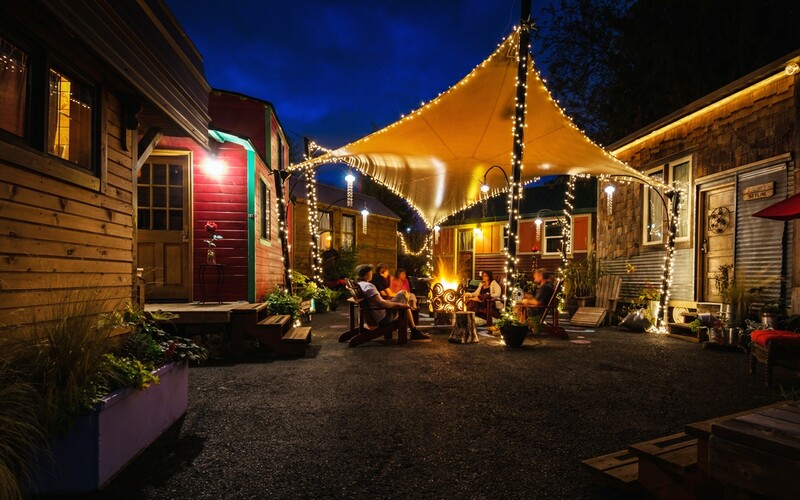 Nestled among the artsy shops and trendy restaurants of Portland, Oregon’s Alberta Arts District sits Caravan, the world’s first tiny house hotel. In 2013, small-living enthusiasts Deb Delman and Kol Peterson transformed a car repo lot into a peaceful urban campground. The renovated space is home to six locally built tiny houses on wheels—ranging between 80 and 160 square feet. The homes form a circle around a central courtyard complete with outdoor seating and fire pit. Each tiny house has its own unique design theme, but they all boast a kitchen, bathroom, sleeping quarters and living area, as well as running water, electric heat, flush toilet and hot shower. While owning a tiny house hotel sounded fun to the couple, the bigger intention was to use Caravan as a public place to showcase small housing, educate the public and do policy and advocacy work, all of which comes naturally to these two. Prior to owning Caravan, Delman founded and ran a nonprofit for nine years, which was aimed at helping at-risk youth. Afterwards she taught social justice and equity issues to high schoolers. Peterson has a master’s degree in environmental planning and urban design from Harvard, and a deep passion for urban density issues. Since its opening, Caravan has averaged a 98 percent occupancy rate eight months out of the year. In addition to hosting travelers from all over the world, it has been rented in its entirety for weddings, family reunions and even a baby shower.